Genre: MMORPGish fantasy, drama, comedy. Also Recommended: Sword Art Online, Utawarerumono, Maoyuu. Notes: Based on a light novel series by Mamare Touno. There are also four manga titles available, one of which follows the story of the novel. With the problem centered around diplomatic connections behind them (for now), Shiroe and his guild -- as well as the city of Akibahara -- fixes their gaze westward. After the confrontation with Lady Nureha, the guild master of Plant Hwyaden, Shiroe worries if there will be a war between the two nations, though more because of how this will influence the people of the land. The original Log Horizon proved to be a show of surprising complexity and world building, which made it a bit of a surprise in the year of its release. Despite being a love letter to the Japanese city of Akibahara (sort of), it not only catered to the gamer culture, but also instilled a sense of community and diplomacy with its surroundings, framing the show in a whole complete package of character, world and story. A bit of a rarity, since most shows tend to center around one or two of the three without necessarily losing any appeal over it. Still, Log Horizon was -- and still is -- a pretty fascinating show. It was also a nice-looking one, so when the second season headed over from Satelight to Studio DEEN, that part took a hit. Not a huge hit, but there has been complaints, and I kind of understand them. It's still a decent-looking show, but it feels cheaper now... somehow. With the things the first season set up, the second season's already got a lot on its plate. Starting off, the Round Table already has a huge problem on its hands when its economic needs far outstrip the capabilities of its coffers. With that in mind, Shiroe brings a couple of friends and allies and sets out to solve the problem with a raid -- aka "a treasure hunt in a special RPG dungeon". Meanwhile, Akatsuki is left in Akibahara, dealing not only with her own insecurities, but also a player killer that sneaks around on a murder spree while wearing a magical and bugged armor that makes him nigh invulnerable. From a revelation-related standpoint, the second season does a lot of things right; it broadens the perspective of this gaming world, while slowly uncovering what and why made Shiroe and everyone else find themselves trapped here. We also finally learn about what's going on in the west; a lot of members of the old Debauchery Tea Party hold high positions there, and Nureha's position as head of Plant Hwyaden might not be as solid as the first season indicate. When we see her again, she's being psychologically abused by another character who seems to hold a very personal grudge towards Shiroe. Furthermore, some of the people of the land seems to also gleefully take part in this new world's growth despite the fact that their deaths, if they happen, are quite permanent. (Rudy's special case notwithstanding.) It's intriguing stuff, most of it, and the show could've benefitted from this if it would take the time to establish all of this some more, at the very least. Because, in a sense, that's all the show does past its first two parallell story arcs. It gets so hung up on introducing stuff that nothing ever is taken to any kind of conclusion or near conclusion. It even abandons one of its biggest Swords of Damocles dangling over its head because... well, it wasn't as important, I guess, despite spending so many episodes setting it up? Yet the show has the time to send the younger generation out on a quest that, quite frankly, is a boring slog with very few upsides outside of introducing a female vampire character that looks suspiciously much like Shiroe... by character design, that is. In short, season 2 feels more like a hazy dream than the first, its directives are somewhat more muddled. For all its popularity, Log Horizon will be a real troll about it if this is all we get. And even beyond that, there is the reintroduction of various characters. The next time we meet Demikas -- the tyrant leader of Brigandia, located in the northern city of Susukino -- he has apparently found himself a wife and shed most of his psychotic, controlling personality. That is a character development I would have liked seeing, especially in light of the fact that his wife is apparently one of the people of the land, which brings a problematic issue to his plate not unlike the one Isuzu the bard must be going through. Instead, he's... supposedly just one of the good guys now, because.... well, because! He's included in the big raid that makes up half of the first story arc, and his interactions with Shiroe are interesting, to say the least, because it's quite clear that neither of them like each other very much, and quite frankly for good reasons. Ironically, one of Demikas's old partners provide one of the more interesting character revelations of the show, which is also, in part, where the show finally goes into the whole "captured in the game" thing. I mentioned the kids' asinine road trip earlier, but even that arc had two upsides. One, it allowed for some personal development of Nureha, and secondly, it finally visits the topic of people who never wanted to get stuck in the game, and are desperately trying to get out of it, whatever it takes. It was one of the things I thought the first mission more or less glossed over and ignored, but while I'm glad this season brought that up again, it felt almost equally handwaved, as if the show included just enough to make us shut up about it without going into it in any kind of depth. Spearheading that is the reintroduction of the old Debauchery Tea Party leader, Kanami, who is also totally excited about all this, despite the revelation that she actually has a three year old daughter. The whole thing gives off a vibe that anyone who isn't totally onboard with being stuck in an RPG is in the "wrong" somehow, even if the show sounds all understanding about it. It's possible that I'm overthinking it, so here's hoping a third season will be allowed, and that it will be allowed to embellish on those who are still trapped within Elder World. On that note, the show finally started offering up some clues as to why exactly all those people were literally caught up in the game, and... well, I hope my assumptions aren't all correct, because... I don't want to say, because it's basically a huge spoiler in itself. Just watch and see for yourselves. Also going absolutely nowhere is Shiroe's relationship with either of his would-be love interests. Minori still has her crush on Shiroe, that much is clear enough, but Shiroe doesn't outright act on any of that -- which is at least understandable to a certain point since she's 14 and he is a college student. But there is even less headway with Akatsuki despite each and every single ending animation practically bashing us over the head with it. In fact, once Akatsuki is done with her own personal arc, she gets sort of relegated to this odd comedy routine. She's clearly in love with him too, but apart from some separation anxiety during the first arc (and the prerequisite lame "duel" between her and Minori near the end), nothing really happens. It really makes the ending animation hard to endure. Hell, even Naotsugu and Marielle are quite openly involved in dating and relationship things, and I'm all with that like I was with Demikas's wife; which is 100% "when the hell did THAT happen?" You're a tease, Log Horizon, and I really loathe that side of you. I would be lying if I said I didn't enjoy this show, but it feels a bit odd to also be disappointed with it. The thing is; I don't really know for sure if this is the anime's fault. It is following a light novel, after all, so the anime itself doesn't necessarily have much say in the matter of how it runs. Still, if I sound all complain-y about this season, please understand how much fun and how exciting I found the first, and while the second season of Log Horizon is still a relatively fun and exciting show, it is noticeably hazier and slower than the first, which is a shame. Still, it granted some more insight into the lives of everyone, so there's no real reason NOT to watch the second season of Log Horizon. As a last note, I would like to go into the dub a bit. Not because this season has any yet, but I did eventually buy the first season on Bluray, and Log Horizon's dub is actually fairly good. It took some time getting used to both Shiroe's and Naotsugu significantly darker voices compared to their Japanese counterparts -- and... well, their designs and behavior in general -- but other than that, there were no major hiccups. In fact, Nyanta really scored the big first prize in the dub lottery, going from a soft, gentle fatherly voice to a smooth, suave pseudo-jive-ish tone. Given how much I liked his character, it was a relief that his English dub voice is one of the better ones in the entire show. Recommended Audience: The show goes away from the bullying subtext of the first season and instead focuses more on a tyrannical aspect when it comes to Plant Hwyaden, a seemingly prosperous community, including the aforementioned psychological abuse its puppet leader Nureha has to endure from one of her companions. That said, the show never really gets truly nasty, so it's fine for teens. 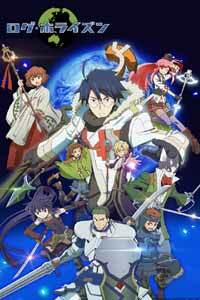 Log Horizon season 2 © 2014 Studio DEEN.